Dr. Ronald J. Trevisani at Lifetime Teeth Today says, with continuing advances in dental implant and missing teeth replacement procedures, more people are eligible for treatment than ever before. 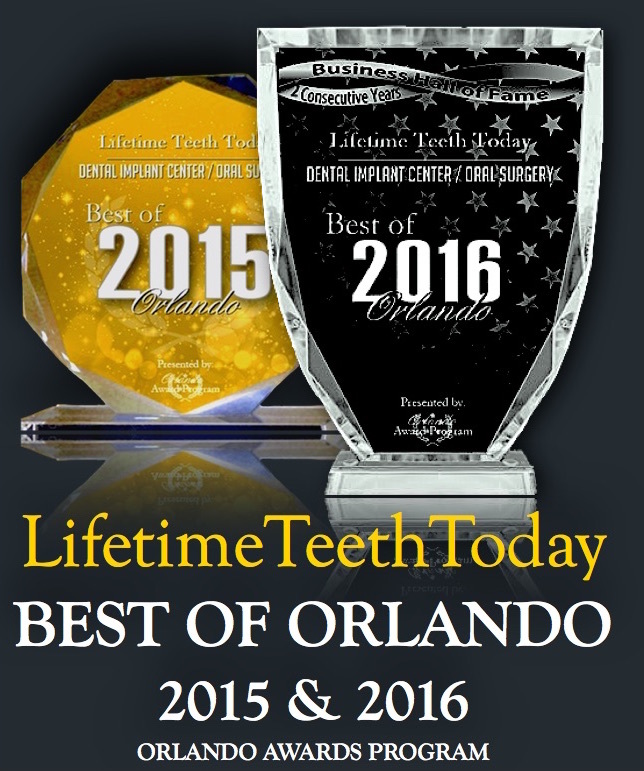 Orlando, FL – Dr. Ronald J. Trevisani says the advent of dental implants can be considered a revolutionary step forward in the field of restorative dentistry, offering individuals all over the world a way to replace missing teeth with results that look and feel natural. 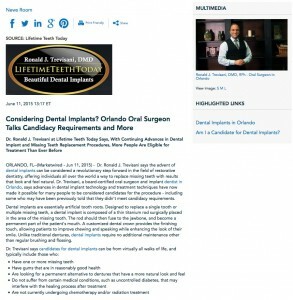 Dr. Trevisani, a board-certified oral surgeon and implant dentist in Orlando, says advances in dental implant technology and treatment techniques have now made it possible for many people to be considered candidates for the procedure – including some who may have been previously told that they didn’t meet candidacy requirements. Dental implants are essentially artificial tooth roots. Designed to replace a single tooth or multiple missing teeth, a dental implant is composed of a thin titanium rod surgically placed in the area of the missing tooth. 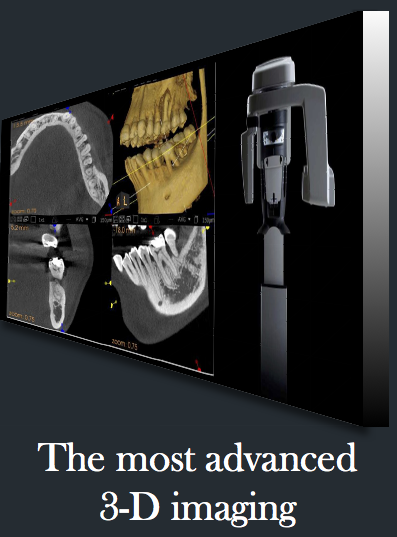 The rod should then fuse to the jawbone, and become a permanent part of the patient’s mouth. A customized dental crown provides the finishing touch, allowing patients to improve chewing and speaking while enhancing the look of their smile. Unlike traditional dentures, dental implants require no additional maintenance other than regular brushing and flossing. Dr. Trevisani says patients who have been advised by another dentist that they do not have adequate jawbone density in the area of the missing tooth to accommodate a dental implant should not be discouraged. He notes that, while sufficient bone density is an important factor in candidacy for dental implants, there are special techniques available at his practice that can make it possible for successful implant placement in some of these cases. If a patient has a severe deficiency of bone in the treatment area, Dr. Trevisani says advanced bone grafting techniques can often resolve the problem and make the patient eligible for the dental implant procedure. For individuals who are concerned about potential pain from dental implant treatment, Dr. Trevisani says the procedure does not give the majority of patients significant discomfort. He notes that, depending on the extent of treatment, the procedure often requires only the use of local anesthesia, particularly when there is just a minimal amount of teeth being replaced, and that prescribed medication can control any residual pain once the anesthetic wears off. Dr. Trevisani says the best way for people considering dental implants to determine whether they are candidates for the procedure is to consult with an experienced oral surgeon and implant dentist for a complete oral evaluation. Once it’s been decided that treatment with dental implants is an ideal option, Dr. Trevisani says a custom-designed treatment plan can be created to provide patients with permanent missing teeth replacement and a beautiful new smile. 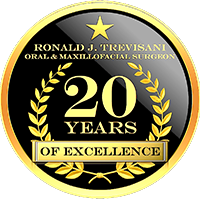 A board-certified oral and maxillofacial Surgeon, Dr. Ronald J. Trevisani has been in practice for nearly 20 years. He is a member of the American Dental Association, the American College of Oral and Maxillofacial Surgery, the American Association of Oral and Maxillofacial Surgery, the Florida Dental Association, and other organizations. Dr. Trevisani’s practice, Lifetime Teeth Today, offers a range of dental implant procedures and is equipped with an onsite laboratory to provide patients with full and comprehensive implant dentistry under one roof. Dr. Trevisani is available for interview upon request. For more information about Dr. Trevisani and Lifetime Teeth Today, please visit lifetimeteethtoday.com or facebook.com/TrevisaniOralSurgery.